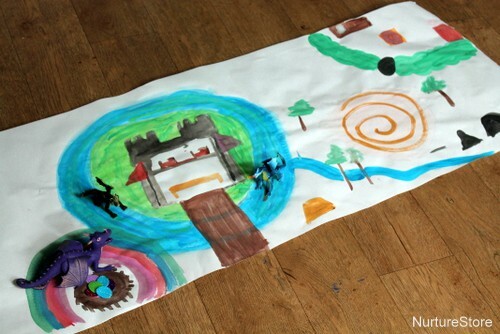 When you make your own playmat you can really use your imagination and create the land of your dreams. 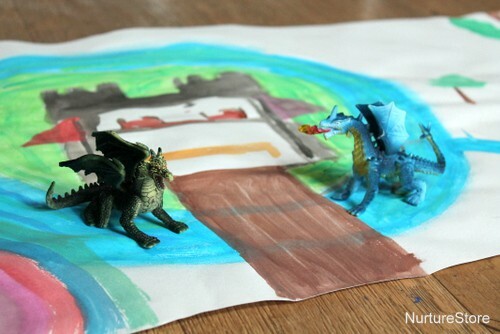 Great for pretend play and storytelling, here’s my daughter’s dragon land and ideas for how you can make your own pretend world. We used a big roll of paper to make our playmat, which is perfect as you can keep rolling out more and more as your world starts to take shape and you want to add in more features. We very often use a roll of wallpaper lining paper, which is really inexpensive, but a roll of easel paper would be good too. We used water colour paints to make our design, which had the added benefit of drying quickly so the children could start playing with their playmat soon after they had finished painting. Our playmat was a collaboration between my daughter and her friend, and having someone else joining in can be a real benefit. You get to swap ideas, build on each other’s suggestions and join forces to make a great big world together. 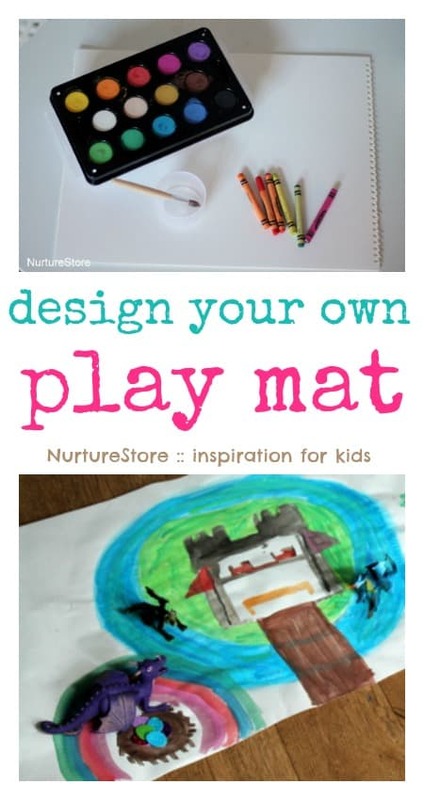 In this way the whole process becomes a storytelling, and making a playmat like this can be a wonderful extension activity to a subject you are studying. You could bring to life a book that you have been reading, drawing out elements of key locations in the tale; or use it to recap on things you have been learning in geography or history – drawing a rainforest, or a Celtic hill fort. 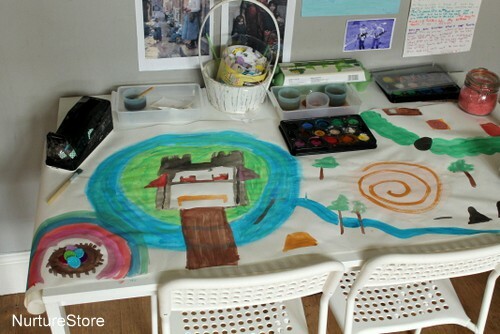 Once you have finished your playmat and the paint is dry, you can place it on the floor and play. Keep some pens and pencils on hand, in case you want to add in extra elements to your picture as you play. Pull in some play characters to turn your playmat into a small world of imaginary play. My daughter’s passion is dragons, as you can see. Having a stock of loose parts available is always a boost to any playtime, as children are encouraged to bring in bits and pieces to be props in their play. 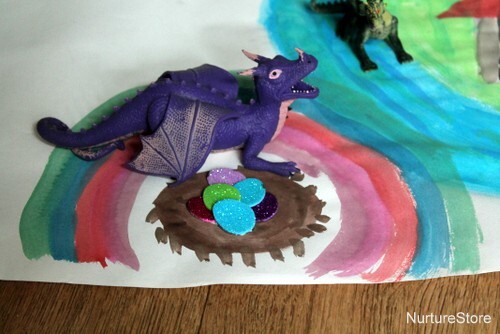 Here the dragon is guarding a nest of sparkly Easter egg stickers! 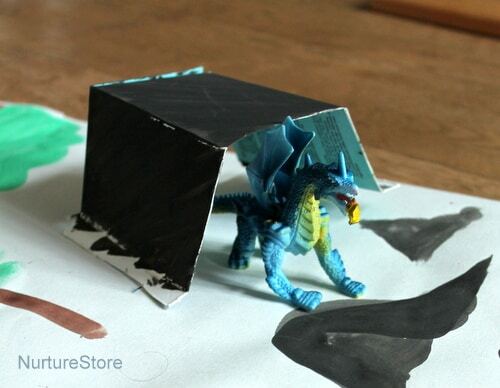 A box of junk model materials – cardboard boxes and the like – can be used to add an extra dimension to the playmat, as you can build up, adding caves, buildings and other features to your landscape. 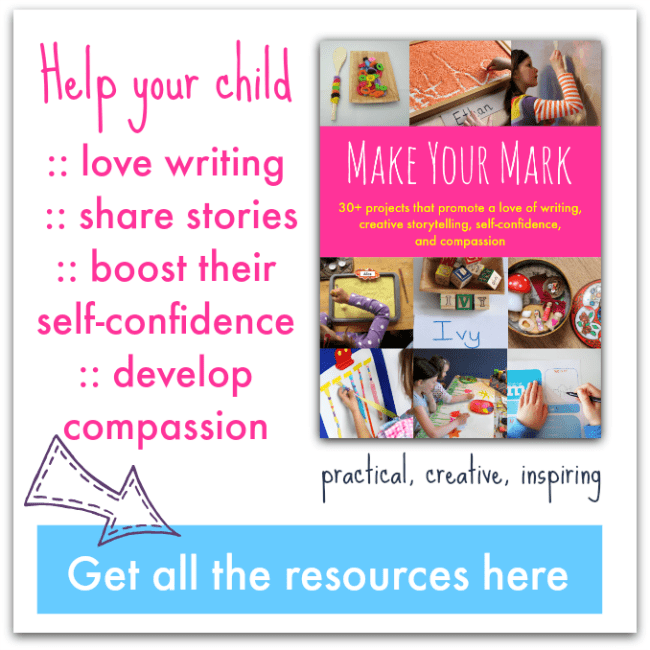 Help your child to make their mark with these wonderful projects that help develop a love of writing, creative storytelling, self-confidence and compassion – along with six sets of bonus printables. 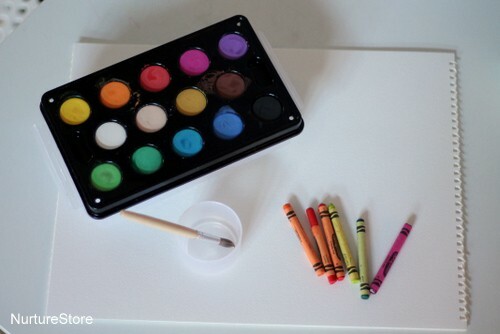 Good idea to combine painting and objects. Game is going on both 2D and 3D. Yes, I love that it adds that extra dimension. I recommend laminating them afterwards . We make them to fit our train table and the lamination keeps them for years and years.